You may remember from my last sewing post that I was keen on wearing more woven tops. Well, scrap that because I just sewed up two of these tees and I already want to wear them everyday. 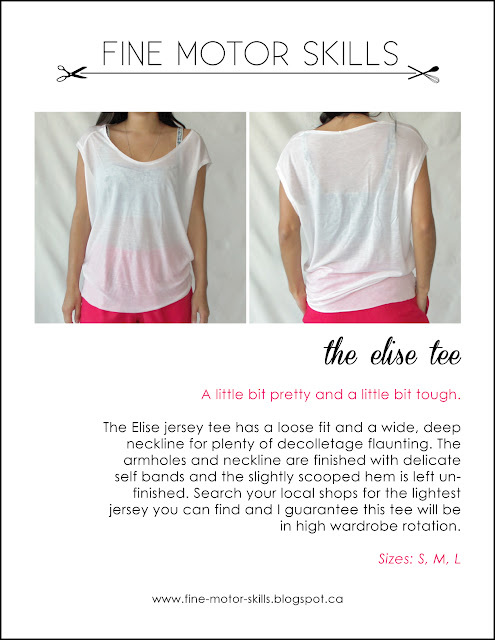 The Elise tee is not quite a tank and not quite a top. It does not have sleeves so it is sort of, kind of like a muscle tee with a deep feminine neckline. I love it because it shows just enough skin but still has enough coverage for a crisp Vancouver spring. It is 14 degrees out and I want to wear tank tops but this tee with a sweater will have to do. To make this your own favourite tee of 2013 I highly suggest you seek out the lightest weight jersey you can find. The black version is made from a modal spandex jersey. The white is made from a sheer 100% tencel jersey. What a find! I'll have to go and grab some more, I love the way it sewed up. I will definitely be making this top with a woven front variation. Silk, please! For those with keen eyes you might notice the white version has shoulder seams further to the front. I added these because after cutting out the front I noticed a fabric flaw on the right shoulder. Grrr. So I shook my fist a little and then used my problem solving skills to re-cut some new shoulder panels. By the way, I also have a pattern for these pink shorts but I wasn't sure if people would be interested in them. They are a lined short with front pleats and sideseam pockets. I made them here in fuchsia linen but they would also be great in silk. Frankly everything is great in silk. If anyone would like me to share the pattern please leave a comment. Digitizing and grading these puppies will take a little encouragement. Thank goodily goodness I hammered out all that formatting on my first pattern. This one took 1/4 of the time! Please download your Elise Pattern here! Or visit my BurdaStyle profile here, where I am uploading patterns. Note* I did not like any of the photos from this shoot where I made eye contact with the camera. Apparently I only liked photos where I look like I find the ground incredibly interesting and a little sad. Love the tee and the shorts! It all looks so comfy. :) I would love to sew both! Glad you like them. They certainly are comfy. Thanks for sharing the pattern!I have a feeling that this is going to be one of my favorite patterns this spring and summer!Please share the pattern for the shorts!They look amazing! I'm still loving this top, I hope you try it. I'm definitely considering sharing the shorts because I'm wanting to wear them every day. Cute tee! I like how if you wore it in summer your shoulders would be protected from being burnt but the neckline is wide enough you can still feel the sun. I second the posts above, shorts pattern please! Both are adorable! The top looks so comfy and cool. Please share the pattern for the shorts too - they look awesome! Wow another awesome pattern! I just wish it was warmer here so I could show it off instead of being hidden under layers and layers of clothes. Please share the shorts pattern! I'm linking your patterns on a Pinterest group board for free patterns and I'd bet we'd all love the shorts pattern!! Skirts... dresses...there's lots of them but shorts? Not so much so please share and thanks so much for the great patterns! Please share the shorts. I love them both!! You look absolutely lovely in both these outfits! Amazing blog and very interesting stuff you got here! I did it, I wear it, I love it, thank you for this really simple pattern !!! I did it in one day, it's so nice to make something and to wear it just after !!! Thank you ! I hope you will propose new patterns soon ! Bye. Thank you so much for your carefully worked-out how-to and the pattern. Exactly the style of shirt i love and will wear again next summer. Hi, very nice Tee, are the seam allowances included or do I have to add them after cutting out the pattern? So cool pattern! Thanks for sharing! love this shirt, i wonder if you would mind sharing what size you are wearing in these photos? I just finished the Elise Tee! I used a very soft tissue knit fabric and it was soooooo easy and so comfortable! I can't wait to make one in white and gray! Thank you so much for this pattern! Amazing! I love wearing such tees with different color tank tops. Very nice post, I am going to buy it as soon as possible for my sister and myself. You are looking nice in these pictures. 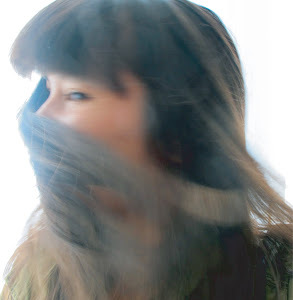 I am going to follow your blog religiously from now on. It was fantastic.